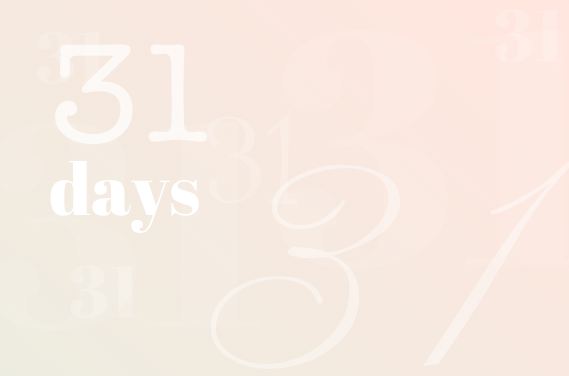 For the last week or so I've been seeing talk of The Nester's "31 Days" series. It seems to be an annual thing that bloggers participate in. You choose a topic and write a short post each day in October on that subject. I enjoy participating in these types of things and it's a good creative outlet as well. I've been thinking on and off of what I might write on. Being that I'm in nursing school and have three kids and try to work part-time too, I don't have a lot of time to research or compose complex posts. This morning as I was doing a short research paper for a nutrition class, an easy but meaningful topic hit me! The last few years, my interest in health and nutrition for myself and my family has increased. Part of this has been due to becoming a runner and reading a lot on running, which leads to exercise and nutrition topics as well. Slowly, I've been making small changes to my own health and nutrition, and my families as well. These will be small, simple things you can do for the good of your body. They will be varied and usually inexpensive. Let me preface this also by saying, by no means are we an extremely healthy family. We eat things we "shouldn't." We have bad habits. We are busy and sometimes lazy. BUT, we are trying. I am trying. I don't have the money or the time to make huge changes. But instead of being overwhelmed by the enormity of health and nutrition info out there, I just pick small things to work on.